The Turin Shroud is believed by many people to be the burial shroud in which Jesus Christ was wrapped following his crucifixion. It is a linen cloth measuring 4.4m by 1.1m showing the image of a man. However radiocarbon dating tests, carried out on the shroud in 1998 indicated that the cloth may date from around 1300 AD. 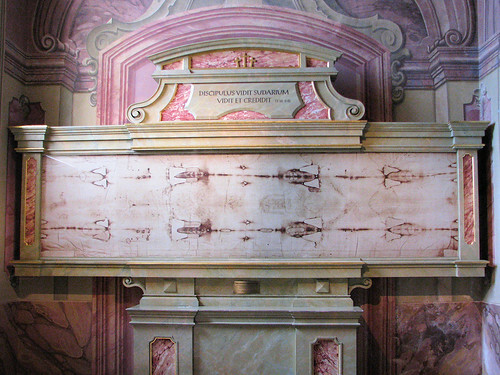 The Turin Shroud is kept in the Cathedral of Saint John the Baptist in the city of Turin in northern Italy. 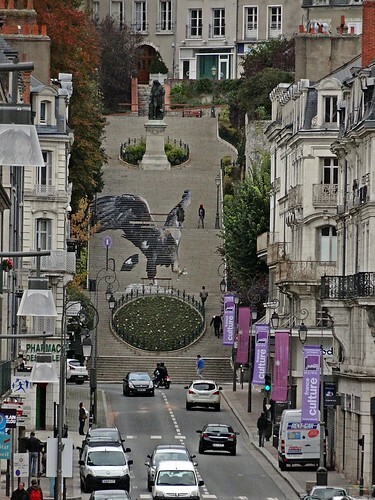 It has been put public display on 19 occasions since the 17th century attracting thousands of visitors each day. Exposition of the Shroud for a period of five weeks in 1978 is reported to have had 100,000 visitors per day. It was last on display from 19th to the 24th of April 2015. The Turin Shroud, which is believed by many to be the burial cloth of Jesus Christ went on display for the first time in 45 years in Turin, Italy in the year 1978 On This Day. 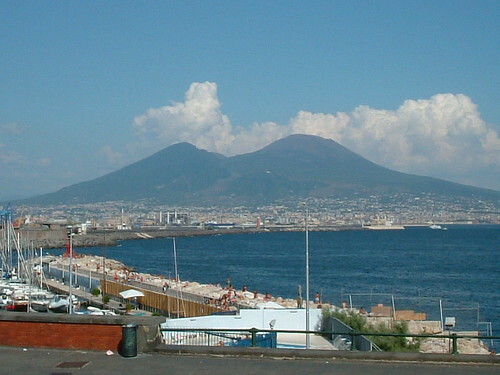 Mount Vesuvius is a volcano located about 9km east of the city of Naples in Southern Italy. The cities of Pompeii, Herculaneum and several other settlements were destroyed and buried when Mount Vesuvius erupted in 79 AD. Though the overall death toll is unknown, the cities and surrounding settlements had a population of 20,000. Mount Vesuvius has erupted on many occasions in history and is regarded as one of the most dangerous volcanoes in the world. There were several eruptions in pre-history and since the eruption in 79 AD there have been up to 42 others. The last eruption occurred in 1944. It caused widespread damage locally. Aircraft and equipment belonging to the United States Army Air Forces based at Pompeii airfield were damaged. Mount Vesuvius erupted and destroyed the cities of Pompeii and Herculaneum in the year 79 AD On This Day. Denis Papin was a physicist and mathematician who was a native of France. He invented the pressure cooker and the steam engine. During his career he worked with some of the most famous scientists of the day. These included Irish physicist Robert Boyle, Dutch physicist Christiaan Huygens and the German physicist Gottfried Leibniz. Denis Papin was born in Chitenay in central France in 1647. He graduated with a medical degree from the University at Angers in 1669. In 1679 he invented the pressure cooker which he called the steam digester. It was a vessel which had a tightly fitting lid with a safety valve to prevent explosions. The valve had a piston held in place by a weight which moved up to release steam. Observing the piston on the pressure cooker led Papin to build a steam driven piston engine in 1690. In 1704 he built a paddle-wheel ship which was powered by his steam engine. It was the first such vehicle to be built. He moved to London in 1704 hoping to work at the Royal Society. He failed to get a position and died in poverty in 1713. Denis Papin, inventor of the pressure cooker and the steam driven piston engine was born in France in the year 1647 On This Day. Potato blight (phytophthora infestans) is a fungus which invades the potato plant and causes rapid decay. It caused the failure of potato crops in Ireland and several parts of Europe during the 1840’s. Due to Ireland’s over dependency on one potato variety the crop failure caused what has become known as the Great Irish Famine. The first recorded instances of potato blight were in the eastern United States in 1843. The disease travelled to Europe in 1845 in a shipment of seed potatoes for farmers in Belgium. The fungus devastated potato crops in European countries and in southern England. It was reported in Ireland at the Botanical Gardens in Dublin in August 1845. A short time later potato crop failure occurred in several areas of the country. 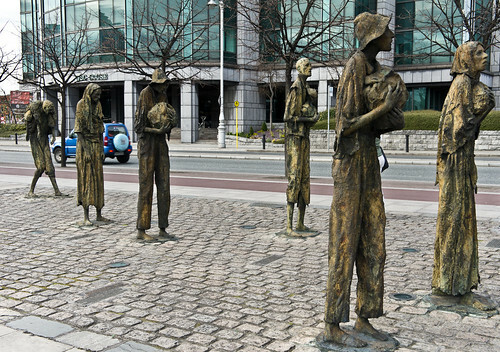 The famine which ensued during the following years had a devastating impact on Ireland. Potato blight was first reported in Ireland at the Botanical Gardens in Dublin by the curator David Moore in the year 1845 On This Day. 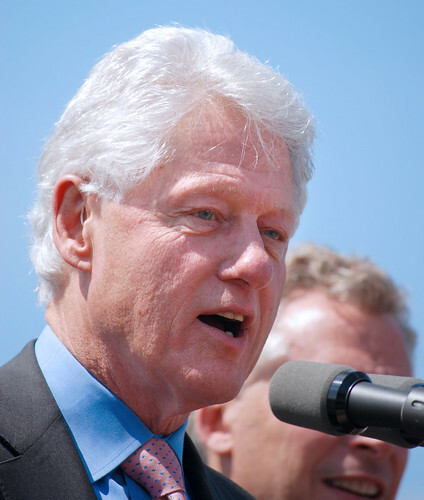 Bill Clinton was the 42nd President of the United States of America. He served for two terms from 1993 to 2001. A lawyer by profession, Clinton served as Governor of the State of Arkansas from 1979 to 1981 and from 1983 to 1992. At the end of his terms, Clinton left office with the highest approval rating of any U.S. president since World War II. Bill Clinton was born William Jefferson Blythe in 1946. At the age of 15 he changed his name to Clinton, the name of his stepfather. Bill Clinton graduated from Georgetown University in 1968 and was awarded a Rhodes Scholarship to attend the Oxford University, England. He later attended Yale Law School and graduated with a Juris Doctor (J.D.) degree in 1973. While studying at Yale he met his future wife Hilary Rodham. During his time at college Clinton became involved in politics. With Hilary he campaigned for the Democratic presidential candidate, Walter Mondale during the summer of 1972. He returned to Arkansas where he served Governor before being elected president of the United States in 1992. He served for two terms and has been involved in humanitarian work since leaving office. Bill Clinton was born in Hope, Arkansas in the year 1946 On This Day.